Dawn Devine Brown provides an overview of many garment styles used in costuming for various types of belly dancing, including some folkloric, some Middle Eastern raqs sharqi, and some Americanized variants such as Tribal and fusion. This booklet contains about 48 drawings illustrating assorted popular belly dance costume styles, including the nightclub "beads and sequins" look, tribal, Gypsy fantasy, and assorted ethnic / historical looks. Each drawing is accompanied by some information about the various garments used to achieve each look, and offers definitions of terms such as "baladi dress" that dance newcomers may have heard but don't yet understand. A quick read through this book can prepare a newcomer to the belly dance scene for watching a large, diverse dance festival featuring a wide variety of dance costumes and styles. The book allocates more pages to modern-day styles (bedleh, Tribal, faux "Gypsy") than to the ethnic and historical styles. This is consistent with the comparative popularity of these different styles in the U.S., but may be frustrating to those who would like more detail about the folkloric and historical attire. Although it mentions the hagalla and fellahin dresses, there is not an accompanying illustration of them, and the dress style commonly used for melaya leff isn't mentioned at all. At the end, the book includes a page of costume vendors with contact information, and a page suggesting books for further reading. Because the book was published in 2002, it doesn't touch on costume styles that have risen to popularity since then. I don't find this to be a problem, though, because it's reasonably easy to find information about the fads currently in vogue. You are looking for an overview of Middle Eastern and North African clothing. You have seen some costumes at dance events that puzzled you, and you'd like a reference book to help you learn more about them. You are fascinated by ethnic clothing. You care only about one particular style of belly dance and don't want to be bothered with information about others. You are looking for instructions on how to make garments. You are looking for detailed, in-depth information. The booklet contains a large variety of illustrations, showing many assorted costume variations that may serve as inspiration when planning your next outfit. It defines many garment names that you may have heard people mention but you weren't familiar with. Maybe it will fill in some blanks for you! It covers each of the major style flavors that is likely to interest dancers: nightclub, Gypsy fusion, tribal (from the American Tribal Style generation), and historic/ethnic. The drawings effectively represent the garments they are meant to illustrate. The illustration above showing the book's cover is an example of what the drawings inside it look like. Overall, the book is well organized. Topics flow in a logical order. It would have been nice if the section of assorted historic and ethnic looks had been 4 or 8 pages longer, to allow more space to show illustrations of garments that the book describes but doesn't picture. I wish the book had included a table of contents or an index. Although the drawings are beautifully detailed in their depiction of the garments, the dancers have no faces. I find this a little distracting. In Dawn's defense, it is typical practice for fashion designers to draw figures this way - I'm just not used to it myself. The parts of the book dealing with Morocco and Tunisia are a bit weak compared to other sections. The caption that should have appeared under the Tunisian drawing appears instead under the assuit drawing. Although it's small, Style File packs a large amount of information into its 40 pages. 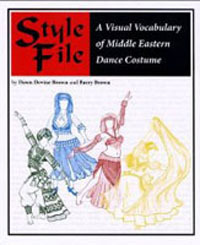 Whether you're a newcomer to belly dance who is fascinated by the wide variety of costume variations worn at various dance events, or whether you're a long-time member of the scene who enjoys adding new resources to your collection, Style File is worth a look. I learned some new things from it myself. I would recommend this book without hesitation as an introduction to the world of costuming for Middle Eastern dance. It provides enough information to help you determine which styles you would like to explore in greater depth.